South Africa and its neighbours are fascinating destinations and many (most?) cruisers take the opportunity to rent a car and head inland. You get a taste of what is to come in Richards Bay. There are lots of monkeys wandering around and there are even hippo crossing signs on the highway between the harbour and the town. We did two trips inland sharing our vehicles with an American couple, Lew and Ann who remarkably are also from Lake Ontario. They are members of Henderson Harbor YC on the eastern shore of the lake. They are very experienced cruisers having been on their boat for 16 years. From here they are going to Europe and want to spend the summer in Scotland. The following summer (2014) they plan to go down the Danube to the Black Sea. 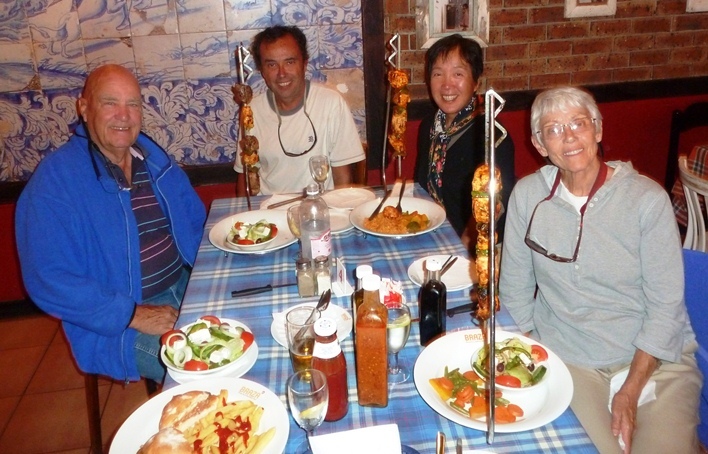 Lew and Ann Tucker along with Bruce and June at a restaurant that served things like a shish-ka-bob on a hangar. We went to three parks for a total of 7 days of animal viewing. 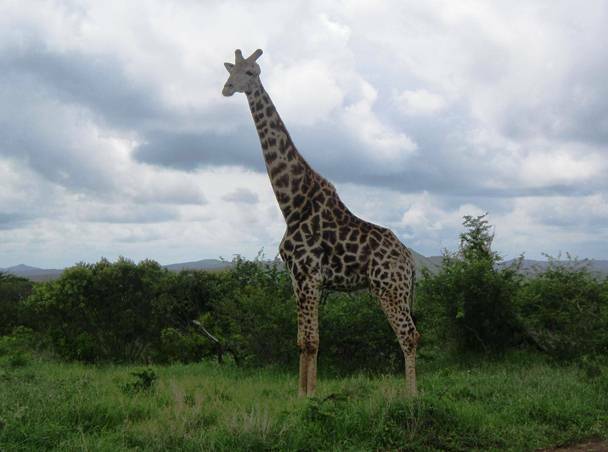 You really only need to go to Kruger National Park since you can see all of the animals there. I can't recommend a visit to this park too highly. It is a remarkable place to visit and a highlight of our cruise. This was our first encounter with large African wildlife. 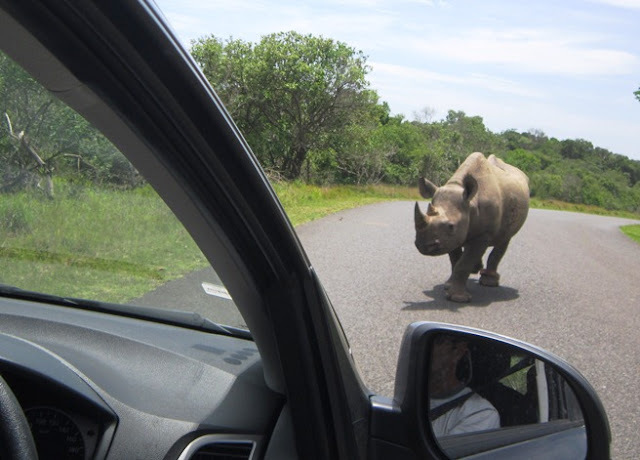 This white rhino was slowly wandering down the main road of iSimangaliso park right towards us. He got very close to us before realizing that we were there (they have terrible eyesight). They also don't seem terribly bright since it took him several seconds to figure out that we were also pretty large and that one of us would have to change course. He then veered to his left and passed us no more than 4 m away. We also met these rhinos on a road, in this case quite a narrow one. You could almost imagine their thought processes as they went from, 'Hey, we wanted to go that way' to 'Well, I guess we will go this way instead.' 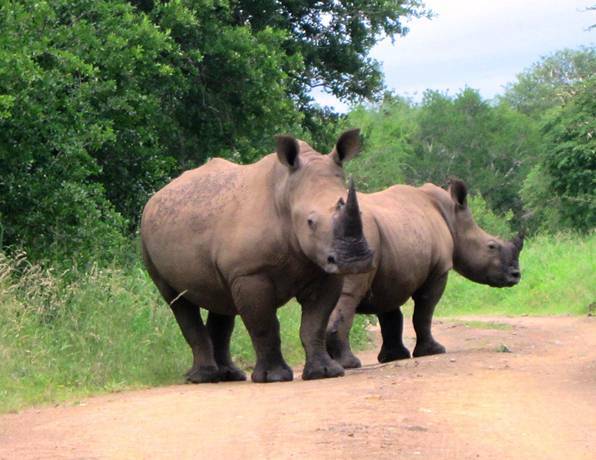 The fight against rhino poachers is a very serious one as a few hundred rhinos are poached every year (the wild population of white rhinos is less than 20,000 while there are less than 5,000 black rhinos in the wild). To indicate the seriousness of the problem, one of the South African papers had the headline, "Poacher shot in ambush". 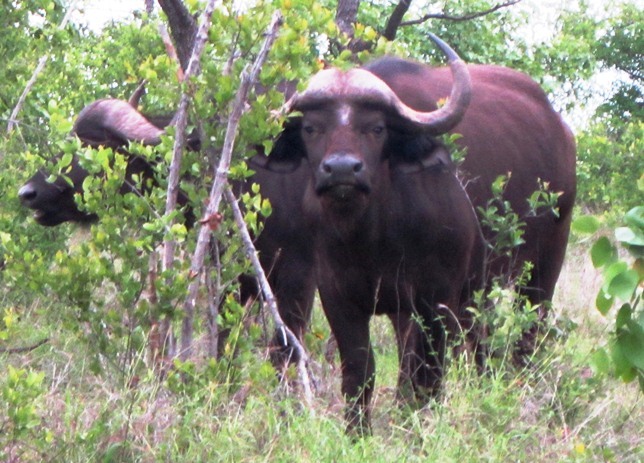 We were lucky enough to see both although our good pictures are only of white rhinos. 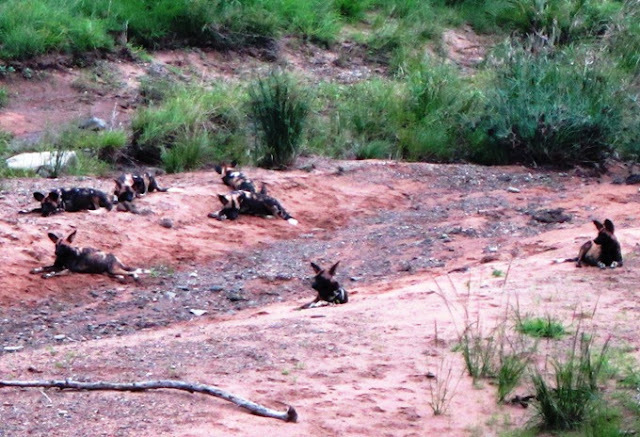 These African wild dogs that we saw in Hluhluwe-Imfolozi park are quite rare and considered endangered. There are only 3000 to 5500 of these animals in the world. We saw this pack of seven resting in the sun next to a waterhole. They have huge ears that they turn toward any sound that they hear. 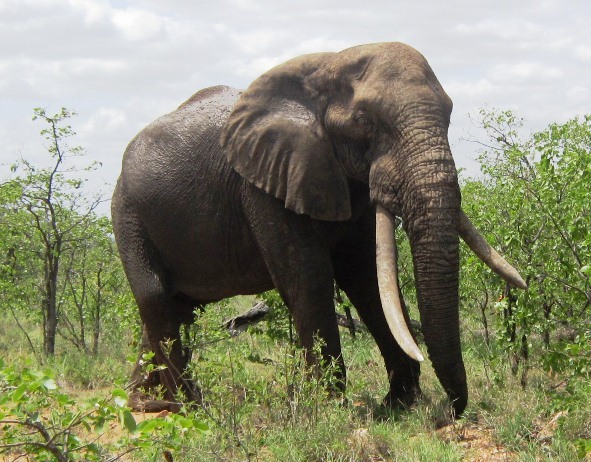 This guy is reputed to have the longest tusks of any elephant in Kruger NP. We managed to bump into him (well not literally) on one of our drives. 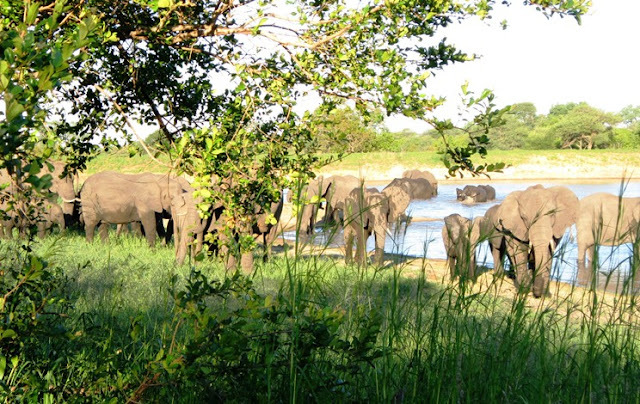 Large groups of elephants contain only females and children of various ages. You have to be very careful around such groups since the Moms are very protective. The park makes a point of displaying photos of cars that have been attacked by elephants.- a large elephant with its front legs on your roof will do more than damage the paintwork. Solitary males in heat are also dangerous - sort of like some guys I have known. We had one close encounter on a narrow road with an apparently agitated elephant and ended up leaving in a hurry. 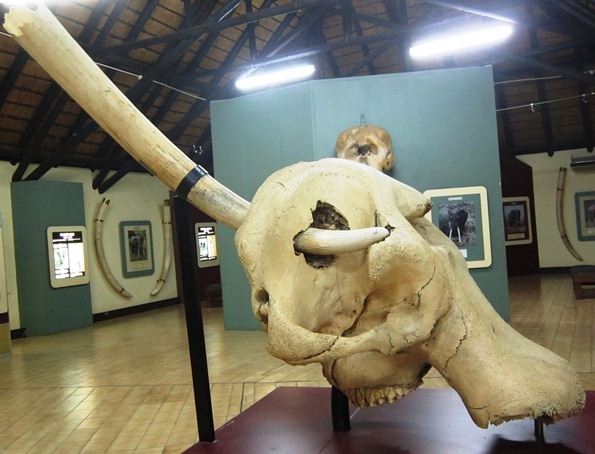 Kruger has an excellent elephant museum. This display shows the result of a fight between elephants. The winner's tusk broke off after it got stuck in the skull of the loser who apparently was on the ground at the time. Elephants are not always the gentle creatures they appear to be. 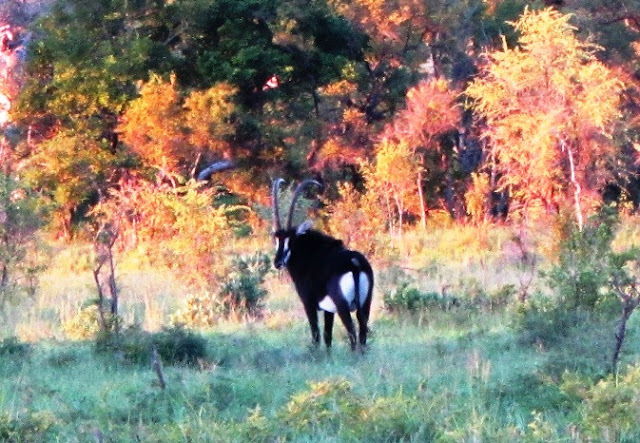 This is a sable antelope. 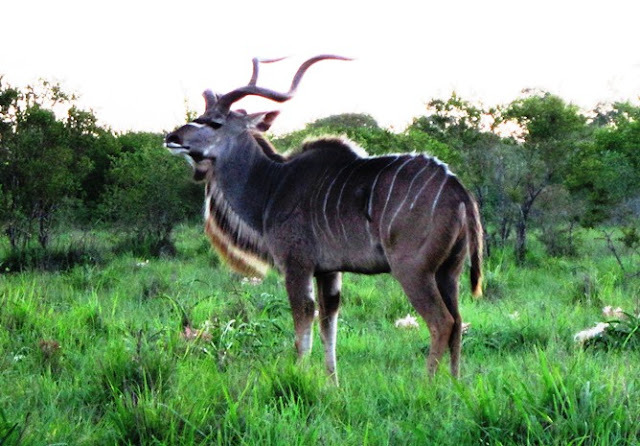 We could not find him in our animal guide and when we showed the picture to one of the rangers he wanted to know if we had seem him inside Kruger since they are quite rare this far south. 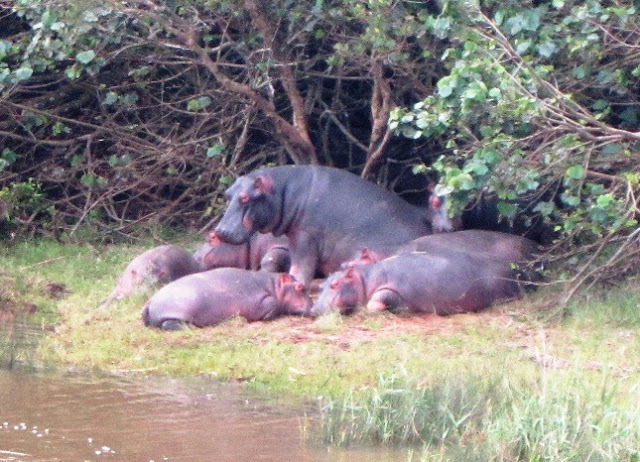 Hippos spend most of the day in the water, but this group was resting on the shore. We stayed in a lovely tourist town named St Lucia. It has one problem (or fascinating feature depending on your perspective). 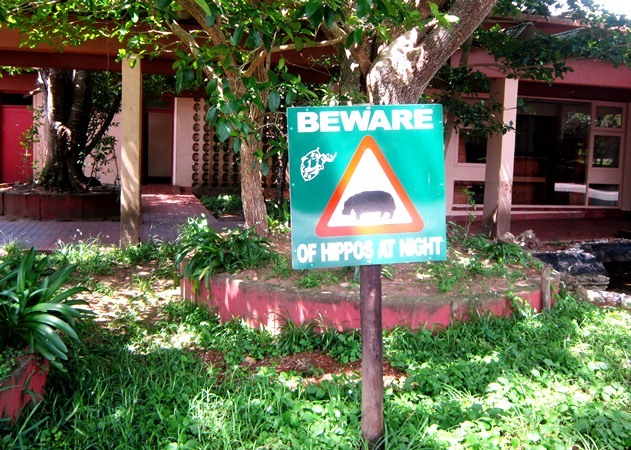 Hippos come out of the nearby estuary at night to eat the lawns in town and they can be very dangerous. A month before our arrival a man went out of his house because his dog was barking. He did not see the hippo in his backyard. The hippo was frightened by the dog and man and bit the man taking off his leg. More people are killed by hippos in Africa than by any other species. You never know who you will be sharing the road with. 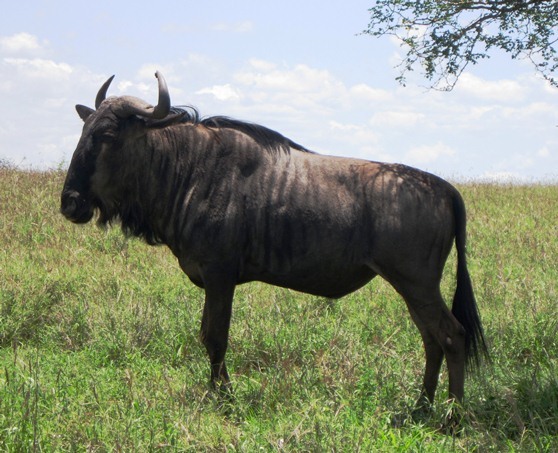 Widebeest are related to buffaloes and have the reputation for being quite stupid. For no particular reason they will start running (and they run very well) and are just as likely to run toward a lion as away. Any time you see many cars stopped in one place chances are good that there will be lions. 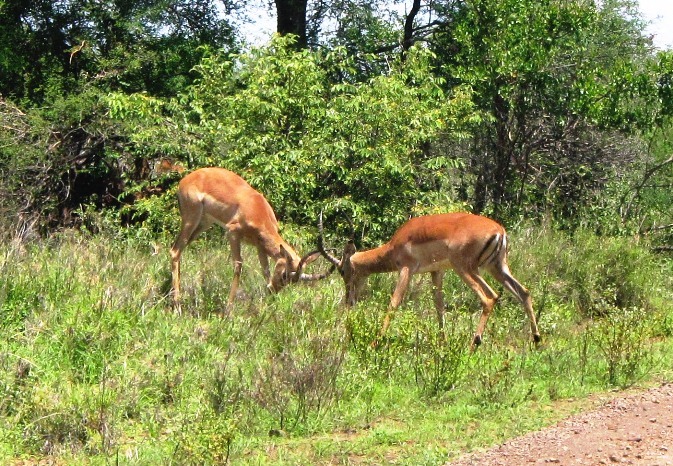 These two chose to mate right beside Kruger's main road. 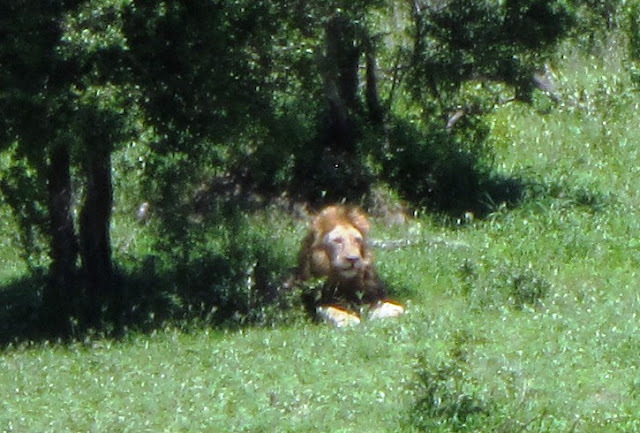 We called this solitary old male the Lion King. He had a very sad-looking face. 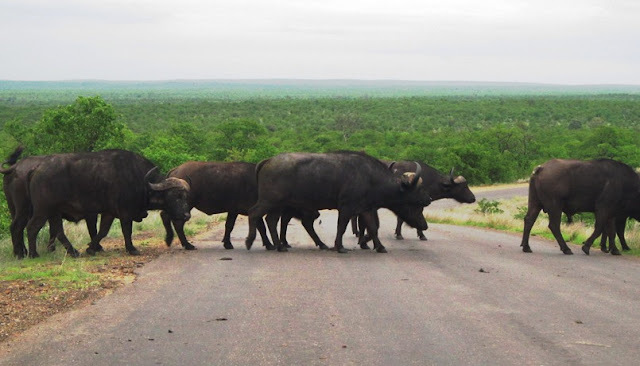 We saw a herd of about 1000 buffaloes cross the road. Fortunately there was a break in the herd and we did not have to wait until all of them crossed. 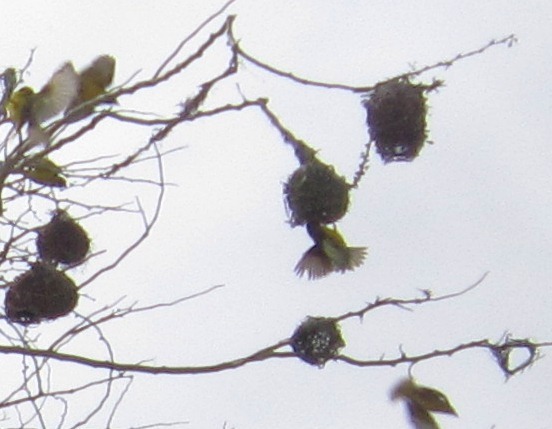 You can see one masked weaver bird building a nest among many other nests. The males build the nests from pieces of grass. After it is done, the female comes along to check the construction. If she approves it is a match made in heaven. If not, she pulls at the grass that attaches the nest to the tree until the nest falls to the ground. Then it is back to work for the male. 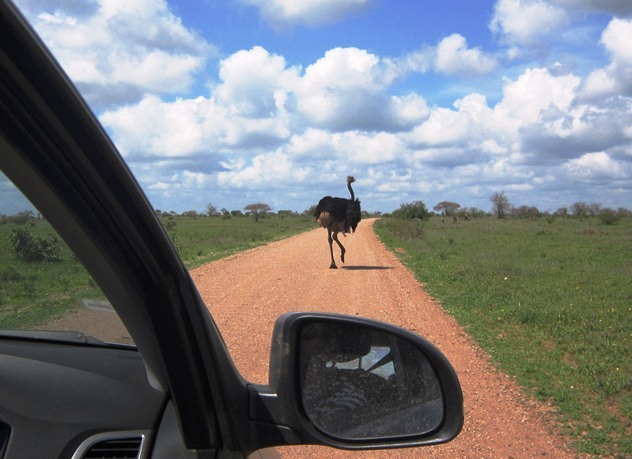 Most animals just ignored the cars in the parks. Giraffes did seem a bit curious. 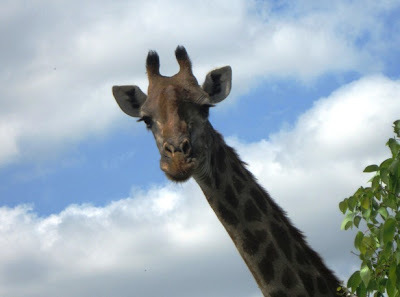 Giraffes are extremely beautiful animals and move incredibly gracefully. 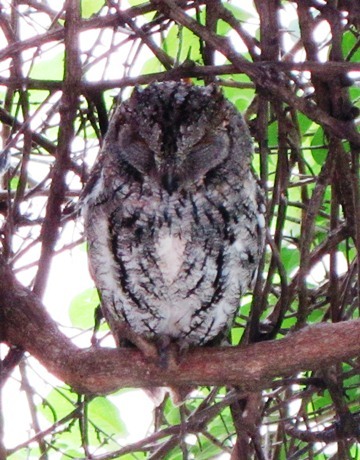 This little owl lives in a bush next to a busy washroom entrance at a rest camp in Kruger. Dozens, if not hundreds of pictures of him are taken daily. 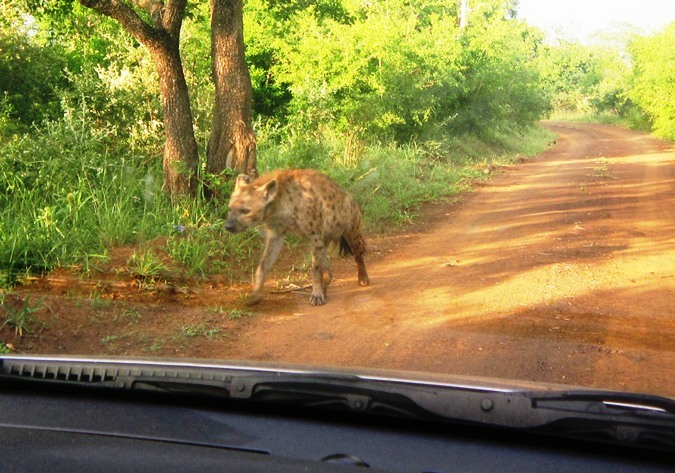 This spotted hyena was just outside the compound in which we were living. All of the accommodations are inside electric fences. Outside these areas you are not allowed to be out of your car unless you are accompanied by an armed ranger. 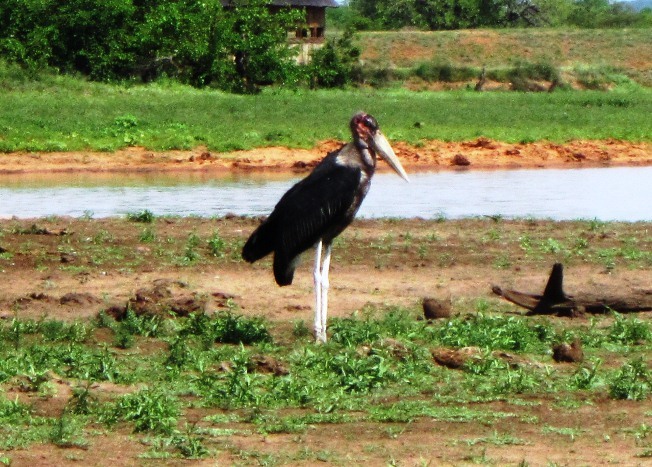 The marabou stork is in the running to be considered the largest bird in the world. They stand up to 5 feet tall and have wingspans to 12 feet. They are also a bit on the ugly side. There are tens of thousands of impalas in Kruger and the other parks. In addition there are many other types of antelopes both smaller (some are not much larger than an average dog) and larger. 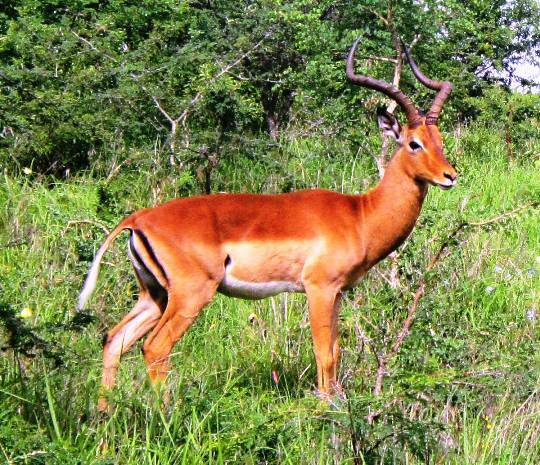 Powerful male impalas have harems with ten or more females. Meanwhile the rest of the boys hang out together and practise the skills needed to challenge one of the dominant males. Not all of the interesting animals are mammals or even very large. These are dung beetles. They make a large ball of poop that they roll to their nest (a hole in the ground that they have dug). They put their eggs in the dung ball and roll into the hole. 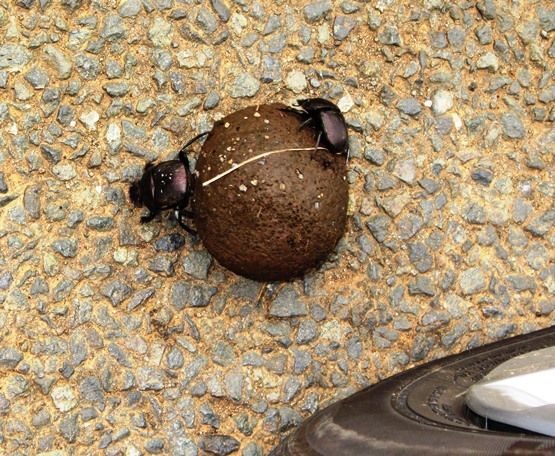 Because roads are convenient spots for rolling, many vehicles have bumper stickers that proclaim, "Dung beetles have right-of-way". Kudus are one of the larger antelopes. The great horns made them attractive to hunters, although it would not be hard to shoot one - they just stand around eating and watching for lions. 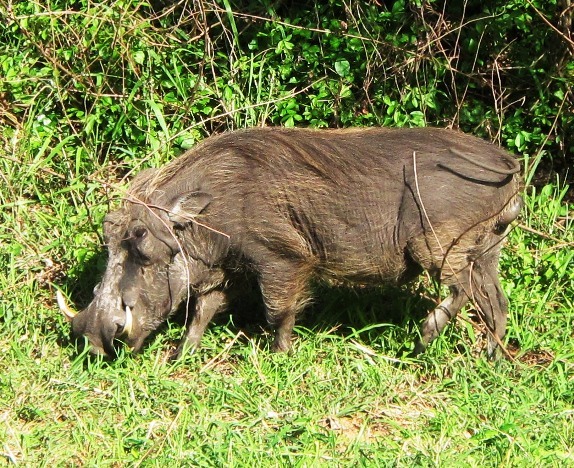 Warthogs have to be one of the ugliest animals in the world. 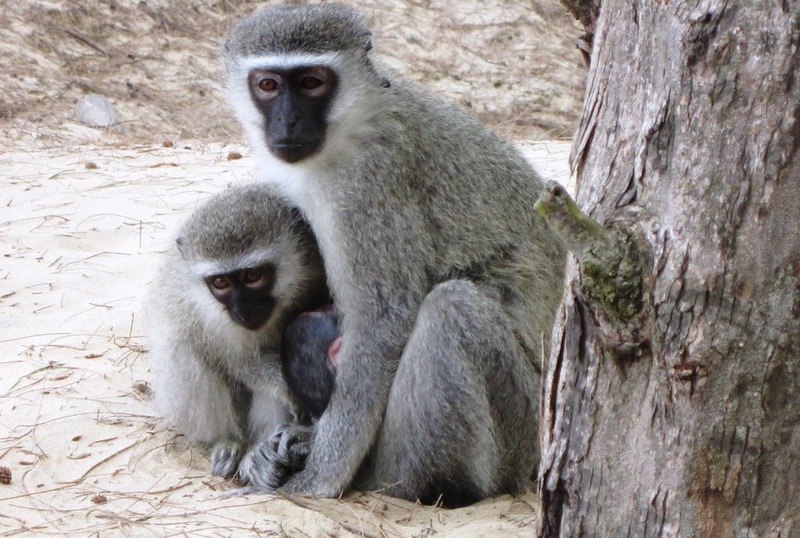 These vervet monkeys look gentle and cute (note the tiny baby between the others) but where they are used to people they become sneaky robbers. We had one steal a 1 kg bag of peanuts off our picnic table. Later, after we were aware of the risk, another stole some cheese. In both cases they wait very patiently a few meters away from you and then strike,, in both cases going between the people sitting at the table. We came to quite like zebras. They are quite elegant beasts and live quietly on the veldt in great numbers often near other grazers. If someone could domesticate them there would be a revolution in the horse market because they are beautiful animals. 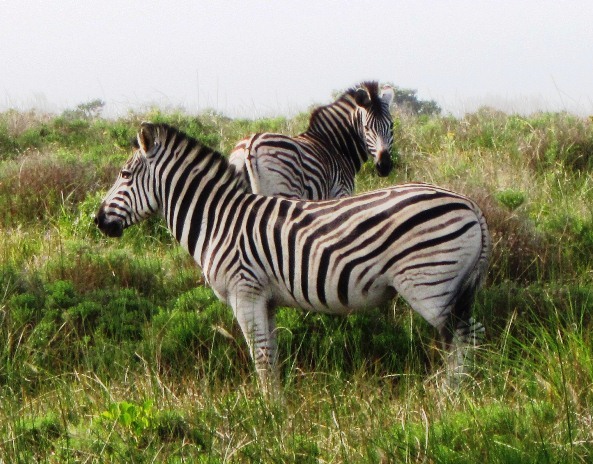 Each animals particular stripe pattern is unique. Posted by Bruce at 12:07 a.m.
You're making me feel better about our anticipated route already. January 4, 2013 at 4:16 a.m.